Skiers visiting Maine can look forward to outstanding snow conditions, beautiful trails and cozy inns and resorts. Spend a day downhill skiing or tubing before warming up with some local pub fare. Visit the Ski Maine Association website for more information on skiing options around the state. You can even have fun skiing in Maine without ever riding a chairlift. Glide around Maine’s well-groomed paths for Nordic skiing. Whether you’re a trekker, classical or freestyle skier, take advantage of the miles of smooth backcountry trails that wind across the state of Maine. From white winter adventures to the cozy and cultural, there are plenty of other ways to explore Maine in the winter. Snowmobilers gather from far and wide to experience Maine’s 3,500-mile, impeccably groomed Interconnected Trail System. Seasoned snowmobiler can hit Madawaska’s International Snowmobilers Festival, while newbies can rent and get oriented at Millinocket’s New England Outdoor Center. The roughly 10,000 miles of snowmobile trails scattered throughout the Pine Tree State means plenty of options. Check out the Maine Snowmobile Association&apos;s website for trail conditions, maps, and much more. Outdoor winter festivals are easy to find all around the state of Maine. Catch the torchlight snowmobile parade at the Naples Winter Carnival or enjoy the snow sculptures at Caribou’s Winter Carnival and Snowmobile Festival. Don’t want to brave the cold of winter? Warm up by cheering on the Maine Red Claw’s basketball team, the Portland Pirates AHL hockey team or the University of Maine’s Black Bears. Winter is the perfect time to soak up some culture in Maine. Relax and listen to a symphony orchestra, explore American art at the Farnsworth Art Museum in Rockland or spend an evening enjoying theater at the Portland Stage Company. When the mercury drops, Maine’s lakes become frozen gathering places to catch pickerel, bass, salmon and trout. Bring your warm clothes and good friends for a weekend in Greenville or Portage Lake. The Maine Professional Guides Association lists hundreds of fishing guides by region and area of specialization. 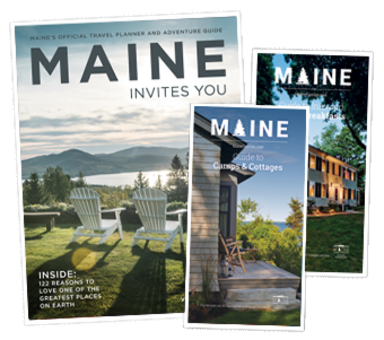 There’s so much to see and do in Maine! Plan your trip today.